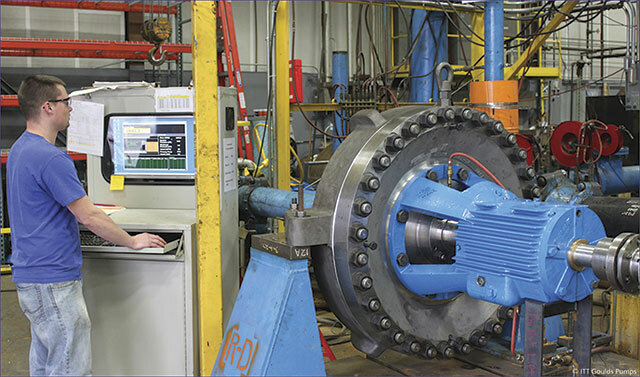 Because cavitation is unavoidable in pump operations, understanding how to reduce it using NPSH calculations is necessary to maintain pump functionality and health. Understanding net positive suction head (NPSH) and cavitation is essential for plant managers, pump manufacturers and operators. Proper NPSH calculations are vital for preventing cavitation and ensuring proper pump functionality. The following 10 facts about NPSH can help end users improve system operation and efficiency. 1. Analyzing NPSH margins can help reduce cavitation. Cavitation is defined as the partial evaporation of a liquid in a system. Vapor forms when the static pressure in a liquid's flow drops below the vapor pressure of that liquid. 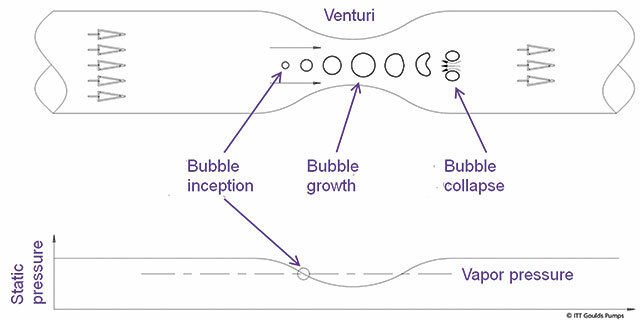 A two-phase flow occurs when a vapor bubble appears and fluid evaporates. When these bubbles enter a region where static pressure exceeds vapor pressure, they will implode, causing cavitation. These bubbles can cause cavities that impair the head and efficiency of the pump, creating excessive noise and vibration. Cavitation erosion can be detrimental to the pump's head and efficiency. Damage to ancillary components, such as bearings and seals, from higher vibration is also likely. The region of the lowest pressure generally occurs around the leading edge of the vane, and this is where cavitation will most likely occur. Figure 2. Analyzing NPSH margins can help reduce cavitation. Although cavitation cannot be completely suppressed in a pump, measuring the required NPSH (NPSHR) and analyzing NPSH margins are key to reducing cavitation and keeping the pump running smoothly. 2. NPSH has two main components. NPSH distinguishes between the pressure available to give to the pump (NPSHA) and the pressure required by the pump (NPSHR ) to limit the reduction of pump head to an acceptable level. 3. NPSHA requires an in-depth calculation. NPSHA is caused by atmospheric pressure, tank elevation or pressure inside a tank. This measurement must be calculated by the user. At sea level, the atmospheric pressure provided is 14.77 pounds per square inch (psi), or 1 bar, which fluctuates depending on elevation. Additionally, the fluid vapor pressure will vary with temperature. With this calculation, the manufacturer must convert pressure to feet or meters and consider the fluid temperature and elevation surrounding the pump. 4. Critical tests determine NPSHR. NPSHR is the minimum amount of pressure required at the pump impeller to limit the reduction in pump head to an acceptable level. Instead of using a calculation as with NPSHA, the manufacturer will run tests to validate the critical quantity of NPSHR. To do this, the flow is kept constant, and the NPSHA is reduced. As NPSHA is lowered, cavitation inside the pump will increase until it begins to block fluid flow through the pump. These tests must be repeated until every flow point has been recorded. NPSHR is commonly called NPSH3, because a three percent head drop criteria is often used during a NPSHR test. 5. There are other forms of NPSH. Many different forms of and acronyms for NPSH exist. Similar to NPSH3, NPSH1 or NPSH0 results when the pump head is only reduced by 1 or 0 percent, respectively. NPSH1, where the "i" stands for inception, is where cavitation first occurs. NPSH40K is the NPSH at which the impeller will have a 40,000-hour life. NPSH40K usually can be determined only by the pump supplier, as in-depth knowledge of the impeller geometry and material is necessary. NPSH 40K typically is used for boiler feed pumps, large critical pumps and for plant owner/operators who want confidence that the impeller will not fail between major overhauls. 6. Three methods can be used to determine NPSH40K. Pump suppliers can determine NPSH40K using three methods. The first method involves building a full-size or a scale-factor test rig of the impeller and recording subsequent damage after a test run. This process can be costly and time-consuming. Another is Vlamming, an empirical method used for stainless steel impellers in water. Using certain parameters associated with the impeller within the equation, suppliers determine a value. Gülich is the third method and is based on the size of the cavitation bubble, which is usually determined by computational fluid dynamics (CFD) and impeller material. 7. Proper material selection can reduce NPSH margin. The new Hydraulic Institute (HI) Standard 9.6.1, released in 2012, provides guidelines and recommendations for NPSH margins, how much NPSHA is needed for a given pump service and what features are needed in a pump based on the NPSHA. Proper material selection in a pump can reduce NPSH margin requirements and, as a result, life cycle cost. During the process of selecting materials, end users should consider materials less susceptible to cavitation damage, which could impact overall system cost. 8. All pumps have cavitation regardless of NPSH. Frequently, pump users infer that as long as NPSHA is above the NPSHR, no cavitation will occur. This is a common misconception. 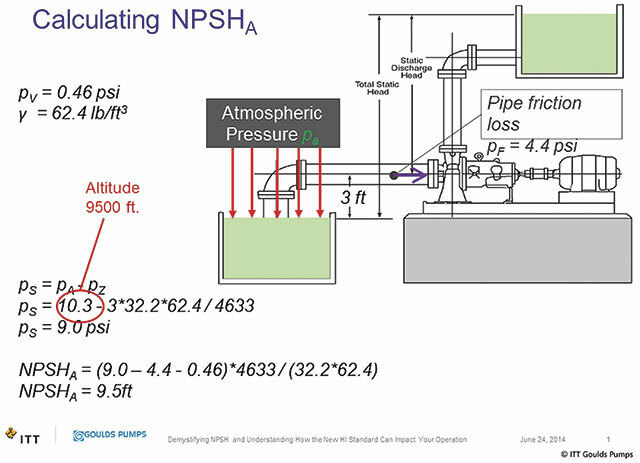 For example, in order to completely suppress cavitation in a pump where the NPSH3 occurs at 19 feet, the NPSH1 occurs at 25 feet, the NPSH0 occurs at 63 feet and the NPSHi at 107 feet, the NPSHA must be about 5.5 times the NPSHR. Few, if any, pumps operate with this margin, revealing that all pumps have cavitation. The only question is whether it is damaging cavitation. 9. Specific materials can help prevent cavitation. Because cavitation is present in every pump, users must find the right materials to minimize damage. The leading material chosen for cavitation resistance is Martensitic stainless steel, also known as CA6NM, chrome steel or 13-4. More resistant materials are available, but they are less common and more expensive, making Martensitic stainless steel an ideal option in freshwater applications. 10. The thermodynamic effect can affect NPSH. If a fluid has a high vapor pressure or temperature, more energy must be exchanged across the vapor-fluid boundary and the vapor bubble. This is known as the thermodynamic effect, or the hydrocarbon correction factor. Cavitation bubbles become smaller, and NPSHR is reduced.